In Texas, beware of zombies. Oh, and Ted Haggard is at it again, too (sent by Ranch Chimp, who comments here). Time to link to Roy Zimmerman again. Here's that PETA ad that was banned from the Superbowl. It's been more than fifteen years now since I quit watching TV, but yeesh, is it still balking at things this tame? One type of business seems unaffected by the bad economy. This is silly, but contains one immortal line: "How would one feel if one was to go walking in nature and suddenly came across a group of naked people?" Mendip recalls the sledding wars of DC winters past. These two make a cute couple. Iowahawk interprets that godawful "pledge" video (if you haven't seen the video, it's here -- don't watch it on a full stomach). Doesn't this usually lead to the end of the world in SF movies? Portland's baby elephant plays soccer. Iceland now has the world's first openly-lesbian Prime Minister. Some French people are still behaving like idiots about the global dominance of the English language. Oh, crap -- if Dubai has enough money to build that giant glass arrowhead thing next to the beach, why doesn't it have a proper sewer system? Rumors abound that the military will soon swear loyalty to Obama personally rather than to the Constitution -- but it's not true. If space weapons are outlawed, only outlaw nations will have space weapons. "This is a relapse into paganism" -- NRO makes Obama sound good! Has pandering to the fundamentalist base locked the Republican party into a death spiral? Right now, per Gallup, only five states -- all with small populations -- lean Republican, while thirty-five lean Democratic. We won, they lost! Americans voted power to Democrats and liberals everywhere, not just the Presidency but the House and Senate too -- so let's act like it (found via Republic of T). A report from the enemy camp -- a pro-choicer infiltrates an anti-abortion conference and finds the anti-choice crowd divided and rudderless. Another view of the psychology underlying the MSM's economic pessimism: "self-indulgent wallowing in hysterical gloom is more fun." Obama may be partly to blame too. If true, this is utterly vile -- judges stand accused of sentencing children to jail in exchange for bribes from juvenile-detention-center operators. Excessive proliferation of laws can destroy initiative. China struggles with its rising gender imbalance. In western Europe, apparently, being against theocratic fascism and for liberal values now means you're "far-right". Terrorism is funded by an Islamic "charity" -- in Ohio. Be sure to read this spirited and very to-the-point essay on the Iran nuclear issue. Turkey's Islamist leader shows his true colors at Davos. The Taliban are extending their rule from Pakistan's borderlands into the interior. Getting healthier on the cheap is now a plum assignment. Darwin's ideas have evolved, becoming more important than ever. Viruses, long a threat, will soon be used as tools to repair spinal nerve damage in humans. As the US prepares to move forward in stem-cell research, Canada still has problems. I believe! I believe in Him! Now there's actual video evidence. In this must-see video, Muslim cleric Amin al-Ansari delivers a breathtaking discourse on history that makes Western "Holocaust revisionists" look like pikers. His views, based on what I've seen over the years, are not all that unusual in the Islamic world -- but it's stunning to see it all set out in one speech like this. This is part of what we're confronting in Islam. Oh, and just in case you're wondering -- yes, he really is saying what the subtitles say he's saying. My knowledge of Arabic is limited, but it's good enough to confirm that. Found via the intrepid moggy-enumerators across the pond. "Now, the truth is sometimes offensive, there's no doubt about that. But it doesn't make it any less true. The truth is, there are millions of people all over the Western world who are absolutely sick and tired of Islam. They're sick of hearing about it and they're sick of making allowances for it that aren't deserved. And they feel enough is enough, and their voices will be heard. The multicultu-ral mafia can pretend it ain't so, and they can pass all the laws they want to, and continue to harass people and shut down internet connections and generally behave like the Gestapo, but it isn't going to work. You can't change people's hearts by force. We are not going to respect Islam until Islam starts to respect us. But then, if that ever happened, it wouldn't be Islam any more. And that, in a nutshell, is the problem." The Blagojevich investigation continues to grind forward, albeit well below the MSM's radar. Saturday saw the release of a passel of subpoenas, served upon "a veritable 'who's who' of Obama staffers, surrogates and affiliates". This thing isn't over yet. Update: Initial reports on this story were misleading: in fact, the subpoenas were issued for Blagojevich's communications with these individuals, not served upon the individuals themselves. The fact that those communications are considered relevant to the investigation, of course, is still likely to be significant. My country, like my company, has weathered the worst of everything and managed to prosper. That’s what we do. We’re Americans, the genetic beneficiaries of adventurers, explorers, optimists. We endure and then we succeed, and the more of us who can maintain our confidence and perspective, the faster this season of misery will pass into prosperity. As I read Edna Parker’s obituary, I imagined a child born this year telling her great-great-grandchildren in 2124 about the Panic of ’08 — an otherwise minor episode in history with which, I predict, few at the time will be familiar. Read the whole thing (more must-read links here). Why is it that most of the MSM are so wildly exaggerating the crisis, seemingly determined to incite sky-is-falling panic over what by every objective measure seems to be a fairly ordinary economic fluctuation? My suspicion is that it has to do with last year's election, in which the media took sides with a blatancy seldom seen before. First, when the crisis suddenly exploded mere weeks before the election, it was immediately clear that its effect would be to harm McCain's chances, even though he was one of the few politicians who had tried to warn the country about looming problems with the housing-loan industry long before. Thus, emphasizing and exaggerating the crisis worked to the advantage of the media's preferred candidate, Obama. Second, now that Obama has been elected, it's important to those same media to be able to portray him as successful -- certainly to avoid the perception of failure. Painting our current problems as a potential second Great Depression in embryo serves this end. If Obama saves the economy (or if it recovers on its own, as there are plenty of signs that it is already starting to do), he'll look like a giant-killer. If we end up with a prolonged recession, the ground will have been laid to tell us that the onrushing disaster was so overwhelming that no leader could have prevented it. The fact that exaggerating an economic crisis and frightening people may actually make it worse in reality doesn't seem to concern the MSM. Luckily, most of the public isn't buying their line, or at least not any more. 77% of Americans believe that the media are exaggerating the problems and are doing harm in the process. I certainly haven't noticed stores being any less crowded. Pessimism has never been an easy sell to Americans, and that doesn't appear to have changed. Catholic Church leaders have managed to get their dicks out of their altar boys long enough to accuse Obama of "the arrogance of someone who believes they are right" for revoking the "global gag rule". Nigerian police claim that a car thief tried to escape them by transforming himself into a goat. Don't laugh. They even have a picture of the goat. Cool moving diagrams illustrate basic geometrical concepts. The BBC has launched a Persian-language TV service. Here's the earliest known photo of a bird-airplane collision. New York's new Senator, Kirsten Gillibrand, seems to be a true supporter of individual freedom -- she strongly favors both gun rights and abortion rights. Sweden will legalize gay marriage in May of this year. Apparently Gene Robinson's prayer at the inaugural wasn't aired by the MSM. It's here. Bruce Bawer speaks out about the shameful persecution of Geert Wilders. (Don't forget to sign the petition). Arab scholar Dr. Sami Alrabaa is a rare voice of sanity on Hamas and Saudi Arabia. Here's a sensible open letter from an Israeli citizen to the people of Gaza (scroll down to 2:55 PM). The EU's common currency, the euro, may have exacerbated the economic crisis for some European countries. The price of faith: Three hundred children have died in the United States in the last 25 years because their parents rejected medical treatment on religious grounds. Here's something you don't see on very many résumés: this man dissolved 300 bodies in acid for a Mexican drug gang. This police chief, though, met a different fate. Here's a more optimistic view of that military report anticipating Mexico's collapse. View 650 million years of continental drift in 80 seconds (found via Mendip). Against timidity, for bold progress: the Order of Cosmic Engineers. British researchers are starting human testing of a stem-cell-based treatment for macular degeneration. Israeli scientists have plans for a nanotechnology-based weapon against cancer. "Information superhighway" is an anagram of "I'm on a huge wispy rhino fart". The English language has a rather unusual distinction: it's the only language which has ever been spoken on the Moon. The greatest of all delusions is the belief that humans have souls. It is from this error that all other errors follow. Everybody looks stupid when they're chewing. If Star Trek fanatics are called "Trekkies", then I guess Harry Potter fanatics should be called "Potties". Every belief which we define as "religion" when a million people hold it, would be described as "insanity" if only one person held it. People who call illegal aliens "undocumented immigrants" should logically also call burglars "undocumented guests". If a Catholic priest's first name is "Moe", one should suspect his middle name to be "Lester". Obama has swept away the vile "global gag rule" on abortion. How long I've hoped to see this day! The FDA has approved trials of embryonic stem-cell therapy for spinal-injury victims, as President Obama is expected to start lifting Bush's restrictions on such research within days. "How dreadful are the curses which Islam lays on its votaries! Besides the fanatical frenzy, which is as dangerous in a man as hydrophobia in a dog, there is this fearful fatalistic apathy. The effects are apparent in many countries. Improvident habits, slovenly systems of agriculture, sluggish methods of commerce, and insecurity of property exist wherever the followers of the Prophet rule or live. A degraded sensualism deprives this life of its grace and refinement; the next of its dignity and sanctity. The fact that in Mohammedan law every woman must belong to some man as his absolute property‹either as a child, a wife, or a concubine must delay the final extinction of slavery until the faith of Islam has ceased to be a great power among men. Individual Muslims may show splendid qualities. Thousands become the brave and loyal soldiers of the Queen; all know how to die; but the influence of the religion paralyses the social development of those who follow it. Far from being moribund, Islam is a militant and proselytizing faith. It has already spread throughout Central Africa, raising fearless warriors at every step; and were it not that Christianity is sheltered in the strong arms of science -- the science against which it had vainly struggled -- the civilisation of modern Europe might fall, as fell the civilisation of ancient Rome." While embryonic stem-cell technology in the United States has stagnated for years under the idiocy of Bush's restrictions, work in other advanced countries has been continuing. Right now, British researchers are about to begin human testing of stem-cell therapy to repair the brains of stroke victims. May their efforts meet with success, and may the US soon begin contributing to this field again, now that Bush is gone. Yet more evidence here. And don't forget this and this and this and this and this. The list of failures, embarrassments, and evils wrought by the Bush Presidency is long: Katrina, head-in-the-sand neglect of global warming, official kowtowing to creationism, ignoring pre-9/11 intelligence warnings, stupid political appointments, the grotesque bungling of occupation policy after the Iraq invasion, an explosion of spending that turned the Clinton surplus into a huge deficit, and lately the financial meltdown. (Don't try to tell me that was Clinton's fault. It happened after eight years of Bush's watch, during six of which he had Republican majorities in both Houses. Making sure this kind of thing doesn't happen is part of his job.) And on and on. But there is one abomination that stands out beyond all the rest. There are many medical innovations still several years away which would already be in use right now had it not been for the Bush administration's criminal obstruction of stem-cell research. For eight years, the country with the world's largest and best-funded research establishment has had its work in the most promising field of medical technology held hostage to taboos derived from a befuddled collection of bronze-age myths. In that field, nowadays, eight years is an eternity. Embryonic stem cells have, in the laboratory, already succeeded in curing animal models of such conditions as juvenile diabetes, spinal-cord injuries, multiple sclerosis, cerebral palsy, stroke, Parkinson's disease, and macular degeneration. Within a few years, adaptation of the same techniques using human stem cells should enable us to cure these conditions in humans. Had it not been for Bush's obstructionism, these cures would be either already here or at least much closer. How many people with these conditions have had their suffering extended for years by the delay of research? How many have died, or will die, who might have lived? Bush's stand on stem-cell research has caused, and continues to cause, far more misery and death than the Iraq war. It is, to me, his most terrible and unforgivable crime. We're long past the medieval fear of witches and demons, right? No, it's still with us, in new forms. Here's some interesting stuff about futurism, complete with flying cars. The jihadists are really going too far now -- they want to behead Madonna. An Arab speaks out on the real nature of Hamas rule in Gaza. The great Catholic-priest horror story continues, in Alaska: There was a calculated effort at the highest levels of the Jesuit order to "'dump' these 'problem priests' in a location in which the priests could avoid detection and continued to sexually abuse countless Native children," the suit says....."They were specifically targe-ting the Athabascan and the Yup'ik cultures, because they wouldn't talk." The economic crisis is hitting export-dependent countries the hardest. Silver lining: this should mean less money for al-Qâ'idah and Hamas. Here's more on the resurgence of anti-Semitism in Europe. And read this essay from Britain -- the comments are chilling. Even though the prophet Muhammad married a six-year-old girl, this Saudi cleric thinks men should settle for old maids of eight or even ten. (Found via Vamp's Worldview.) And it's a good thing I'm not writing this posting in Victoria, Australia. The US military pegs two major countries as being at real risk of imminent collapse into chaos. One of them is Pakistan. The other possibility is even scarier. Is Bush the worst President ever? Dissenting Justice has another candidate for that title. See a map of the Moon, drawn before Galileo's observations. The universe may be a hologram. Here's a short overview of what nanotechnology could do for human health. Take a good look at this report (found via Counting Cats) on the wave of pro-Hamas demonstrations and riots which have swept the Western world in the wake of Israel's counterattack against Gaza. Its numerous photos and videos document beyond dispute the real nature of what we are up against. In Calgary, Neo-Nazi "Aryan Guards" march in the vanguard of a Muslim demonstration. In Germany (!) police break into a private apartment and remove an Israeli flag to appease a Muslim mob. In Los Angeles, chants of "Put Jews in ovens!" and "Long live Hitler!" In Copenhagen, "We want to kill all the Jews, all the Jews should be slain, they have no right to exist!" and "Heil Hitler!" In London, mob violence sends police fleeing in fear and confusion. There is a lot more -- only from the report itself can you grasp the flavor and character of these events, as no mere list of examples can convey. This is the reality of the civilizational struggle which some of us still pretend is not happening. This is what we have allowed to inflitrate the Western world -- a new outbreak of the ghastly infection we thought we had wiped out, at terrible cost, sixty-four years ago. The only party that doesn't seem to grasp what's going on is the MSM themselves. There's not much that they could do about the technology issue, but where hard-news reporting is concerned, they seem too busy digging to notice they're in a hole. During last year's election cycle, this became so blatant that pretty much everyone has stopped pretending media bias isn't a serious issue. One candidate, anointed early on as the media's favorite, got a free pass on the intensive investigative vetting that apirants to the Presidency must normally undergo, and now the country will be paying the price for that for a long time to come. If, in the first months of 2008, the media had shown as much diligence pursuing substantive issues like Rezko, Ayers, Wright, and the whole murky history of Obama's suspiciously-fast rise to prominence in one of the most notoriously-corrupt political cesspools in the US, as they did later on in rooting out trivia like whether Sarah Palin had ever been to Little Diomede or not, we'd be getting ready for Hillary's inauguration today. There was little effort to maintain even a pretense of objectivity, despite the lesson of Rathergate several years ago -- that bias and distortion are far easier to expose than they used to be. On the internet, if you're willing to make a little effort, you can find coverage of any major story from every viewpoint. It's not hard. I knew about Rezko and the bomb factory and so on, as did anyone else who was paying attention. It's the people who still get all their information from the sites of the established newspapers and TV networks who don't know what's going on. Aside from bias, the media are turning away from the seriousness and solidity which they still claim as their strong point. In most newspapers, most hard-news items are wire stories (usually also obtainable on the internet), not original reporting, the exception being local news. In mid-2007, when circumstances forced me to cut back expenses, I canceled my subscription to my own city's daily paper. Since then, the times when I've seen an issue have not inspired me to re-subscribe; half the time the headline story was some sports thing even when there was real news going on, and reporting was slanted to suit the paper's pet biases (pro-illegal-immigration, for example) just as much as the editorials were. Meanwhile, where in the MSM can you find the kind of ongoing on-the-spot reporting that, for example, pure bloggers Michael Yon and Michael Totten have been providing from the Middle East? They certainly have a point of view, but who in the MSM doesn't? I don't think that either Michael would be dumb enough to think he could get away with just not mentioning that a university hit by an airstrike had a bomb factory in it. Yes, in theory bloggers can say anything they choose and get away with it, and in theory this could be dangerous, but I think in practice not so much. Take, for example, the relentless efforts of so many PUMA bloggers to push the "Obama isn't a natural-born citizen" meme (explained here if you're not familiar with it). If there's anyone who has a predisposition to want to believe this story, it's surely me -- but even though I've read about it almost exclusively on the blogs that were pushing it, they've failed to convince me that it has any substance, because they can't produce any hard evidence to support it. Yes, there are people who will read only sources they agree with, and will believe only what they want to believe; but there have always been people like that, and they'll manage to live in a world of their own delusions regardless of what media are available. Local newspapers still have an edge in reporting local news; there aren't wire stories about small-town elections, for example, so the newspaper itself has to actually report on such an event. But local bloggers covering local issues are on the rise as well. If the MSM are heading for extinction, it's not exactly because they're dinosaurs in a changing world. The dinosaurs couldn't adapt fast enough. The MSM, by contrast, just aren't willing to make the effort. Unity in diversity? Three different ideologies march together in a common cause -- perhaps because they aren't really so different after all. There is an ever-expanding range of new things and concepts in the world, and in order to talk about them, we need to create words for them. English has usually done this either by using old words with new meanings (what would a Victorian have made of "using a mouse to surf the net", even though every word would have seemed familiar? ), or by inventing new words in various ways (that same Victorian would not have recognized "laser" or "transhumanist" or even "homophobia"). Both practices continue today; many of us know that not every shipper deals with UPS and that not every cougar's bite need be feared, and recent coinages I like include "hamashole" (Hamas member) by blogger "Aussie Dave" of Israellycool, and "deathist" (opponent of life-extension technology), though I'm not sure who came up with that one. A couple of reports from the pro-Israel rally in Trafalgar Square. Update: The Tygrrrr Express has some observations and links on opposing rallies in Los Angeles. Mendip prophesies the DC traffic Obamapocalypse. Here's a cool video with evolving machines (found via Sentient Developments). My city's biggest baby is lively and cute. Free Us Now blog has a couple of improved versions of that awful Ms Magazine cover. It's no surprise that these Western-style calendars are catching on in Russia. Do you smoke? Look at this. British buses carry the atheist message. They should display this poster too. Spain, once one of Europe's most fanatically-religious societies, now embraces secularism. Could it be that only atheists go to Heaven? Intelligent WSJ commenters blast media bias. Mark Steyn looks at the newest eruptions of the oldest hatred, from Florida to France. Transterrestrial Musings has more here. Economic meltdown? Pooh. Ambrose Evans-Pritchard predicts that the United States will re-emerge as the world's undisputed leading nation this year. And 77% of us say that the media are exaggerating the economic crisis. Michael Yon finds our British allies in Afghanistan to be excellent fighters, but badly served by their government where equipment is concerned. This is consistent with what I've read elsewhere. Click here to watch a fine video about the prophet Muhammad. 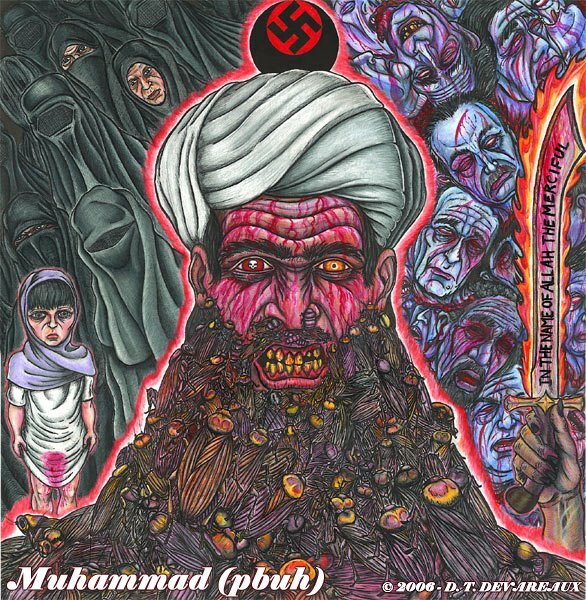 And don't forget the greatest and most truth-filled Muhammad cartoon ever. This is the mentality Israel is fighting. The British working class feels betrayed. They have a point. How did prehistoric quarter-ton flying reptiles get off the ground? Not like birds. Microscopic diamonds reveal a cataclysm 12,900 years ago. Isaac Newton was the first human to use a parabolic mirror to focus an image, but his invention was anticipated -- by a fish. Could Neanderthal man rise from the grave of extinction? Jump the Curve lists ten technological achievements of 2008. Genetic screening gives a family a cancer-free baby. Nanotechnology shows promise for repairing the brain. We already know the enemy’s weakest spot, and it’s not just in Tehran, it’s also in Damascus and its in Riyadh. The enemy’s weakest spot is the bankers and politicians who support militias like Hamas. These mob-style governments don’t understand diplomacy, they understand extortion, influence and brutal pursuasion. To fight terrorism, we need to show the terrorists and their supporters that we can reach out and destroy them at any time, and destroy all they hold dear. Assad isn’t afraid of Israeli bombs, but he would be afraid of a government that showed him how vulnerable he is. We should stop thinking WWII and start thinking Godfather. Assad’s favorite horse’s head at the foot of his bed would probably intimidate him more than tons of bombs falling on Gaza. I read the Hitler vs Hamas article - more scary stuff, but at least it lets everyone know where Hamas stands. My approach to the "militant Islam" problem is assassination. As soon as a nutty militant leader appears anywhere in the world he should be killed. The government involved would make no mention of it or deny any involvement; people would just start mysteriously dying. Any militant who finally gained power would die immedi-ately.....I think we have to play hardball with these folks. It is rather odd that we embrace the taboo on assassination so uncritically. Given the inexorable fact that dangerous maniacs exist and sometimes rise to positions of great power, what is the most effective and moral way of dealing with them? Take for example our biggest and most menacing immediate problem -- Iran. Why would it be worse to kill off Khamenei, Ahmadinejad, and the few hundred similar bloodthirsty fanatics who hold power at the top of the Iranian state, than to deal with the threat by a conventional war in which tens of thousands of ordinary Iranian soldiers and civilians would be killed and the leaders who are the real problem would mostly remain untouched? Of course, the case in Iran is easy to make since by all accounts the Islamist regime there is hated by most of the Iranian people. In other cases, such as Nazi Germany or the present-day Gaza Strip, we find genocide-minded regimes apparently supported by most of their subjects. In such instances, conventional military action is probably unavoidable. But wherever possible, if we must kill to protect ourselves, isn't it best to kill the guilty and spare the innocent? California isn't the only place where a discriminatory and harmful initiative passed in November. Arkansas voters also enacted a ban on gays (or actually "cohabiting couples") adopting children or becoming foster parents. It's important to be clear about what the issue actually is in cases like this. The reactionaries likes to frame the question in terms of whether it's better for children to be raised by heterosexual (or married) couples than by homosexual (or unmarried) ones. But that isn't the choice which exists in practice. Since the number of children needing homes exceeds the supply of available places for them, banning worthy but unpopular people from adopting just means that the children they would otherwise have taken in won't get adopted at all. The question is not whether A is better than B; it's whether B is better than nothing. Adoption restrictions can also prevent children whose biological parents can't take proper care of them from being placed with close relatives with whom they already have a close relationship but who happen to belong to a group disliked by bigots -- even in cases where that's what the biological parents want. The reactionaries' rhetorical squid-ink on this issue can best be dispelled by the facts about actual cases of real people whose lives are affected. You can read about several such cases, and prospects for a challenge to the Arkansas law, here. Europe's traditional position on the Arab dispute has been quietly changing: It is gravitating closer to a US-Israeli framing of a war on terror, a "clash of civilizations," with a subtext of concern about the rise of Islam.....Causes for the shift are complex and manifold, and in no small way associated with the rise of Muslim populations in Europe. But since Sept. 11, the discourse and psy-chology in Europe has shifted, with pro-Arab support "diluting and weakening," as Karim Batir, with the International Institute of Strategic Relations in Paris, puts it – and converging with US-Israeli framing of a fight against terror. That "rise of Muslim populations in Europe", and the resulting threat to European liberal values and civilization, is a crucial factor which remains little-understood in the US. As I have said before, we think that Europe doesn't have any equivalent to our far-right puritan religious extremists waging a "culture war" on gays, women's equality, etc. -- but in fact, it does. It's just that in Europe the religious extreme right is Muslim, not Christian. And they're actually even more dangerous since, unlike most Christian fundamentalists, they do not hesitate to use and endorse violence. Europe itself is not the Europe of decades past, dominated by French diplomacy, with its Arab ties. There are 27 nations. Eastern and former Soviet states, like Poland and the Czech Republic, often take American positions on foreign affairs. As Prague took over the EU presidency last week, it issued a statement that Israel's actions in Gaza were "defensive" – later backing down under French and British censure. In Scandinavia, traditionally pro-Arab states have found social tensions with new Muslim populations – the crisis in Denmark over a cartoon of the prophet Muhammad, for example – and public support for Arabs is down in polls. The value of what eastern Europe brings to the table cannot be overstated -- the fervor for freedom of the newly-liberated, and a vigorous sense of national and civilizational identity which the groggy peoples of western Europe have half forgotten. There is a general 'Arab fatigue' in Europe.....Europe fears an Islamist threat, whether internal or external, and this has begun to change the overall views on the Israel-Palestine conflict. It is amazing how long it took this point to sink in. The long jihad against Israel, the terrorist attacks in London and Madrid (and in New York and Beslan and Mumbai), the intimidation and thuggery in the cities of western Europe, the genocide in southern Sudan, the persecution of non-Muslims in Malaysia and Indonesia, the endless killings in southern Thailand, and on and on -- are all part of a single global phenomenon. This onslaught singles out Jews for especial hatred and violence (as fascism and Communism did), and proclaims explicit loathing for secularism, gender equality, and sexual liberation; but ultimately all non-Muslim people and values are its targets. The day will come when the Europeans will recognize the debt they owe to those who first raised the alarm. Pim Fortuyn and Theo van Gogh (men with impeccable liberal credentials) were murdered; Oriana Fallaci died in exile in the US; Ayaan Hirsi Ali, who was born into Islam but renounced it and embraced Western civilization with the fervor of one who had seen and lived the contrast, was hounded out of Europe and remains under threat of death. But they saw the danger, and they told the truth, and the lands that scorned them are finally waking up. Update: Background on cowardice in the face of Islam here; report from Dublin here; and a pro-Israel rally in, of all places, Paris. Is Hamas like the Nazis? Is it fair to compare Hamas to the Nazis? Actually, there are some important differences between the two. The Ukulele Orchestra of Great Britain performs the theme from Shaft. Pick up the action here at Cannonfire, then follow the link in the first paragraph. To summarize, someone got hold of a document relating to the divorce of Barack Obama's parents years ago, and word began circulating among the Obama citizenship conspiracy theorists that this document contained some reference to the couple's son (that is, Obama himself) having been born in Kenya -- which would mean that he was not a "natural born" citizen in the Constitutional sense and would be disqualified from becoming President. The document was shipped to a radio broadcaster who had promised to examine it and proclaim the truth to the nation. Breathless enthusiasts tracked the progress of the Fedex envelope containing the document and announced its safe arrival. A time was set when all would be revealed. And then.....nothing. The document contained no reference to Obama having been born outside the US. The broadcaster and bloggers changed the subject to a lengthy disquisition on the fact that Obama's father was not a US citizen, something which has been known for years and does not disqualify Obama himself from being a "natural born" citizen. Can we please stop wasting time on this nonsense? Verily 'tis by faith in Blagogate alone that Man shall be saved from eternal Obamnation -- not by the vain works of citizenship-addled bloggers. It has been said that there is no such thing as civilized warfare, but throughout its decades under siege, the state of Israel has always sought to demonstrate the contrary. The Gaza operation continues this tradition. During its effort to stop the jihadist rocket bombardment of its southern cities, Israel has allowed dozens of truckloads of medical supplies to enter the Gaza strip, and has even gone to the trouble of telephoning Gaza civilians living near military targets to warn them to leave before those targets were attacked. As a result, despite the extremely high population density in the Gaza strip and the standard jihadist practice of stationing weapons and command posts in civilian areas (turning Muslim civilians into human shields), the number of civilian casualties has so far been astonishingly low. The great majority of the 500 or so persons killed so far have been Hamas terrorists and enforcers, and have included at least three high-level leaders. This contrasts starkly with the consistent tactics of the jihadists against Israel: rockets fired at random into cities, bombs targeting buses or discos or crowded streets. It is the contrast between the civilized and the barbaric -- between the civilized and the Muslim. All this, of course, wins no credit with the idiot mobs of western Europe, who will rage against Israel whenever it acts to defend itself, no matter how extraordinary and unprecedented its efforts to act humanely. Where were all these protests when Hamas was firing thousands of rockets at Israeli towns? Nevertheless, there are signs that other governments are exerting much less real pressure on Israel to back down than they have done in previous cases, whatever cowardly statements they make in public. Perhaps they have become exhausted or enlightened or both after decades of appeasement of terrorism which leads only to more terrorism. Perhaps they are finally awakening to the real nature of the enemy. And now the ground operation has begun. May the forces of civili-zation prevail. Their victory is in the interest of all of us -- even the yammering ignorantsia in the streets of London and Paris. Dave Barry has his 2008 year in review up. Israellycool takes an amusing look at Hamas terrorist profiles. Watch some amazing helicopter aerobatics. For the doom-and-gloom, moan-and-groan crowd: a reminder that in the areas that matter most, life is getting better and better. Australians are taking a stand against internet censorship. Perry de Havilland, too, issues a call for defiance. Jihadists in Pakistan plan to kill girls for going to school. Common sense about Muslim barbarism continues to advance in the Netherlands. Former Muslim Ibn Warraq takes a look at the Islamic Heaven. Yet another close Obama associate is now being investigated for corruption. Caroline Kennedy for Senate? Oh...My Valve blog has a better suggestion. Pro-Proposition-8 religious bigots whine as the economic weapon begins to bite. I support this tactic; weren't boycotts an important weapon in the 1960s civil-rights struggle as well? Here's a look at what's really crippling the US auto companies. This makes it rather clear why bailouts do not help. Israellycool continues to provide liveblogging coverage of the Gaza operation. Apparently Israel is actually fighting to win this time. A top-rank jihadist leader has been killed. Alan Dershowitz explains why there's no moral equivalence between the two sides. Even some Muslims, such as the Egyptian Foreign Minister, have been critical of Hamas. Big surprise: many celebrities are scientific ignoramuses. Gene therapy not only stops but reverses heart disease in lab rats.